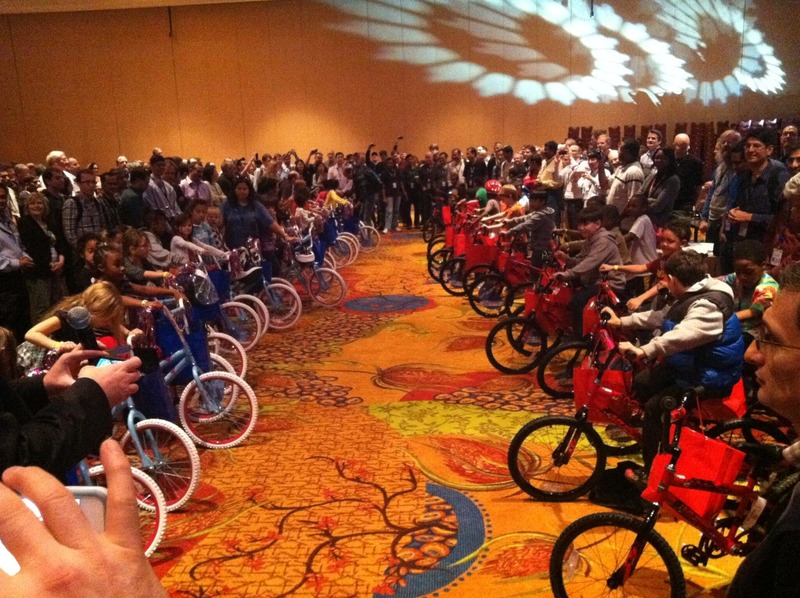 Intel Corporation hosted the Build-A-Bike ® event at the JW Marriott Hill Country Resort and Spa in San Antonio Texas for 600 people, known as Techfest. Intel is a global corporation, with more than half of Intel’s manufacturing done in the United States. Intel’s U.S. investments have made it one of the top employers in both Arizona and New Mexico—as well as Oregon’s largest corporate employer—with key facilities in eight states. Employees across these campuses take pride in supporting local schools, non-profits and educational math and science-based programs. The Intel International Science and Engineering Fair, a program of Society for Science & the Public, is the world’s largest pre-college science fair competition for more than USD 3 million in awards and scholarships. The Build-A-Bike ® is a team building event that teaches teamwork skills through a series of challenges which the teams are to complete. The tasks encourage the teams to think outside the box to come up with solutions. While they are learning to work efficiently as a team, the overall lesson is that everyone works together to reach the same goal, build bikes. It was quite challenging for 86 teams to come together at first but then one of the team captains stepped on to the stage and made an announcement to the group what needed to be done in order to get the puzzles complete to earn the bikes to put together. It was truly amazing to watch 600 people in a ballroom come together running around and helping each other solve the puzzles. One participant said ” This is truly amazing to watch and I am so glad to be apart of this”. Karen Iverson was the event coordinator and provided us with six Intel support staff to help in assigning the teams and the judging, they were fantastic to work with. 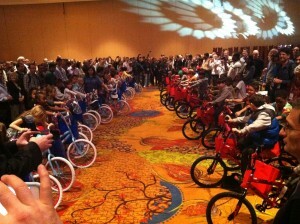 Intel arranged for the kids to have pizza and lemonade while watching a movie until it was time to receive the bikes. The charity that was set to receive the bikes was the Boys & Girls Club of The Randolph Air force Base and what a great way to give back then to give to those children whose parents are deployed. As the charity spokes person and a uniformed soldier/mother approached the stage it was very emotional for some of the participants, “This is absolutely moving, what a great thing Intel is doing”.